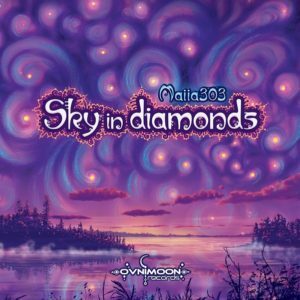 Ovnimoon Records is excited and honored to present Sky In Diamonds, the fourth album from Alla Vagner, better known as Maiia Project in the chill out and downtempo scene, appearing here as Maiia303 to present her approach to progressive trance. By adding the numbers “303” to the project name Maiia is paying tribute to the legendary Roland TB303, an iconic instrument central to the development of the Goa trance style that you will hear on every track. This album contains nine tracks beginning with a soft opener and continuing through melodic and progressive Goa trance realms until reaching a conclusion with a downtempo track in a 7/8 time signature. In addition to the many hypnotic melodic and amazing synths you will also hear Helen Bass providing live bass on several songs. Enjoy this unexpected mix of classic Goa trance and atmospheric progressive psytrance with influences from old school breakbeat and acid house music! Mastered by Edward Cybered at Manifold Studio with cover artwork by Olis. MP3 Download | FLAC Download | WAV Download · Download count: 8,578. I have to admit I was skeptical after hearing “slow goa”, but this album is superb. “Universe” has me thinking of totally different approach to mid 130’s. Thank you for saving this one for solstice. Not my style, but the opener is pretty awesome! The lesson learned isn’t a new one: Thou shalt listen in full before rating anything. Or at least try to get through up to somewhere past the half. (You Had Already Rated This Post. Post ID #7546.) “*****” for an opener, but went to “***” and totally lost me even before Atman. Which was the last drop to “*” which is ~ “oh boy do you need it?” Thank you for the experience. My guess is that Basilisk could give the patience lessons to the Dalai Lama himself. EXCELLENT – High Quality !!! Super! High quality! Супер Альбом. Алла – молодец!! Yup, one of those albums that I download in FLAC, instead of mp3.